Now you can Lock your Keyboard and Mouse and keep all the applications running as usual on your Windows Computers. This Keyboard & Mouse Locker allows you to Block Input to your Windows Computer. The Input to a Windows Computer is typically sent using Keyboard & Mouse. Windows Computers using Touch Screen also send in Mouse Event to underlying Operating System and you can block all type of input to your Windows Computer using this Free Keyboard And Mouse Locker Utility. 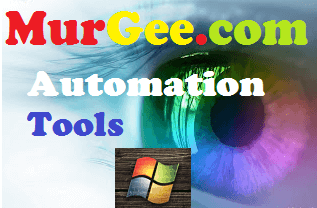 This Application requires Admin Access and hence, you would need to have admin rights in order to use this utility and block keyboard and mouse input to your Windows Computer. Download and use this free utility on your Windows Computer. You can launch the Keyboard & Mouse Locker from Desktop Icon or from the Icon in Programs Menu. The Main Screen of the software is displayed above and has only two buttons. 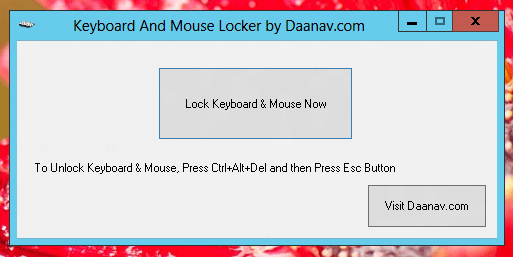 One Button Allows you to Lock Keyboard & Mouse of your Windows Computer and the other button allows you to visit Daanav.com . Once you Click on the Lock Keyboard & Mouse button, the application will block keyboard & mouse input and will minimize itself automatically. In order to regain access to your Keyboard & Mouse and start using your Windows computer, you would need to press Ctrl + Alt + Del and from the Lock Screen displayed, you can press Esc Key and come back to your Desktop or Application running. You can also download another free software named Lock Computer which Locks your Windows Computer and prompts user to authenticate himself / herself in order to gain access to the computer.